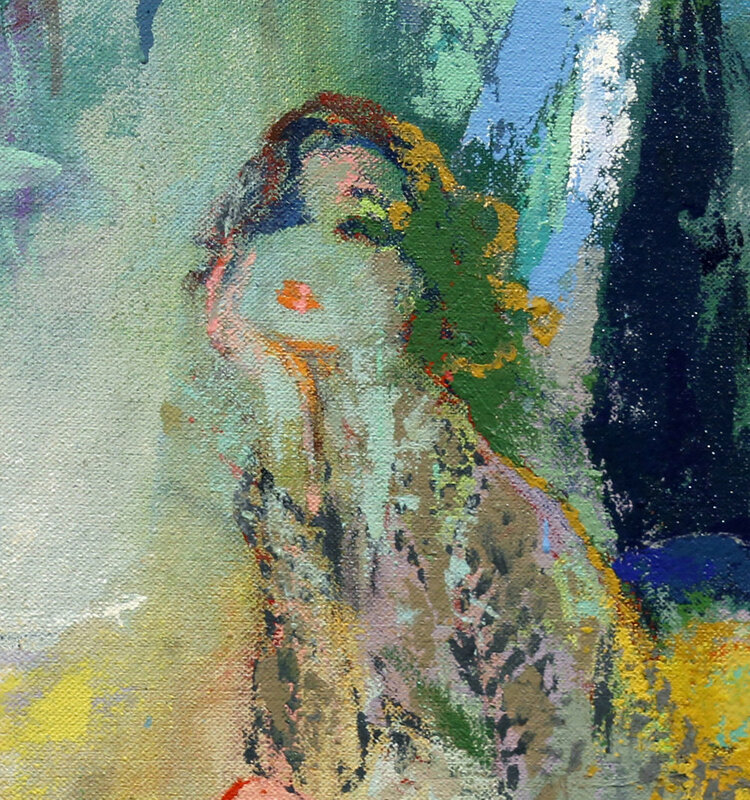 Franklin Bowles Galleries is pleased to announce the temporary exhibition of LeRoy Neiman's historic and monumental work "Fouquet's" 1991-92 in our New York Gallery, courtesy of the LeRoy Neiman Foundation. Although one of his most important works, it has rarely been exhibited in public since it was completed in 1992. That same year, it was included in the Salon d’Autonme at the Grand Palais in Paris. In 1995, it was the centerpiece in Neiman’s American in Paris exhibition. Since that time, Fouquet’s has remained in LeRoy’s studio where he chose to keep it all to himself for the remaining 20 years of his life. In 1899, Louis Fouquet purchased Le Criterion, a small neighborhood bar servicing the coachmen of the rich residents who lived nearby. He changed the name to his own and anglicized it by adding a possessive apostrophe; English was considered highly sophisticated in France at the turn of the century and Fouquet hoped to draw wealthy tourists to the new establishment. Thus Fouquet’s was born. Located at the corner of Avenues George V and Champs-Élysées, its terraces run for 100 feet of sidewalk space along both avenues and its glassed-in red awning-covered seating extends more than 20 feet out into the sidewalk. This most visible terrace in Paris became the place to be seen for over a century. The Haussmann-style granite building shelters a traditional Parisian brasserie décor and menu. In the late 1920s, Fouquet’s became the favored meeting spot for French cinema elites and today is the site of the annual gala dinner for the César Awards, the French equivalent of the Oscars. Since 1990, the main room is listed as a historical French monument and is an essential destination for many visitors. Fouquet’s offers a monumental précis of important themes in the art of LeRoy Neiman (1921-2012): performance, leisure, and looking. By 1991, Neiman had frequented the legendary Parisian brasserie Le Fouquet’s for nearly half a century, first as a young GI in newly liberated Paris, and later as an artist and bon vivant seeking front row seats to the dazzling urban spectacle of the Champs-Élysées. Neiman described Fouquet’s as a “pay-per-view café,” in that the price of a drink or a meal on the terrace afforded unparalleled access to the most celebrated avenue in Paris. While French monuments and architecture were favorite subjects of the artist—here the Arc de Triomphe looms in the background— the real attraction to Fouquet’s was the endless parade of passersby and the eclectic crowd of patrons, all entangled in a web of peacocking and exchanged glances. Neiman paints himself, sketchbook in hand, underneath the brasserie’s signature red awning, partially obscured yet unmistakable with his handlebar moustache. In the tradition of the 19th century flanêur, Neiman appears in the crowd but on its margins, the ideal vantage point from which to observe the human drama unfold. The paint handling in Fouquet’s is representative of Neiman’s mature style, with visibly loose and rapid brushwork. He offsets halcyon blues with brash red and yellow highlights, activating the painted surface to convey a sense of dynamism and motion. While some faces are clear and expressive, others disappear into a hat or are merely suggested through shape and shading. Torsos give way to frenzied brushstrokes rather than stable legs, underscoring the fleeting quality of the image: these individuals share this urban stage but for a moment. Neiman’s interest in capturing ephemeral, seemingly ordinary moments of daily life reflected a deep engagement with art history, including both Impressionism and the journalistic style of the American Ashcan artists in the early 20th century. Like the artists he studied, Neiman sketched from life throughout his career. However, Neiman situates the transient scene of Fouquet’s in history with various nods to the storied past of Paris. In the foreground we clearly make out the front pages of Le Figaro, the newspaper founded in 1826, publisher of the momentous “Futurist Manifesto” in 1909. 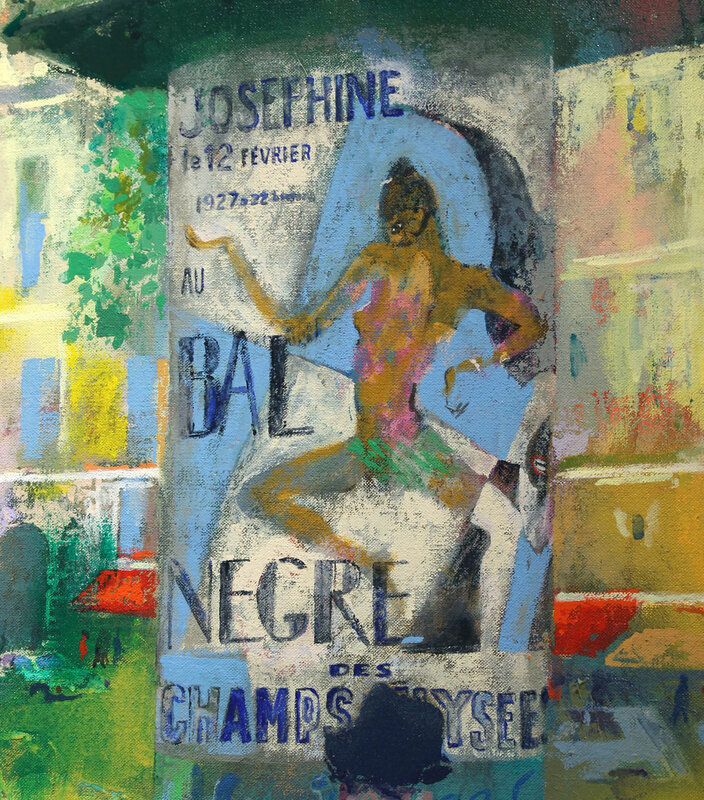 A poster to the right of the sidewalk advertises Josephine Baker performing at Le Bal Nègre, a reference that belongs to the late 1920s rather than the early 1990s. Below the poster, a bearded man dressed like a 19th century dandy surveys the café terrace. A recurring character in Neiman’s work, he is a boulevardier, or walker of the boulevards. Positioned opposite the figure of the artist, he stands in for Neiman’s artistic predecessors, the 19th century writers and painters who walked the same streets, intent to document the rapidly shifting landscape of modern life.